Often, in enterprise mobile application development, there is more need for mobile applications to build than mobile skills in house. To bridge mobile skill shortage, the idea of citizen developers had been thrown into the ring and since generated a lot of interest in enterprise development. 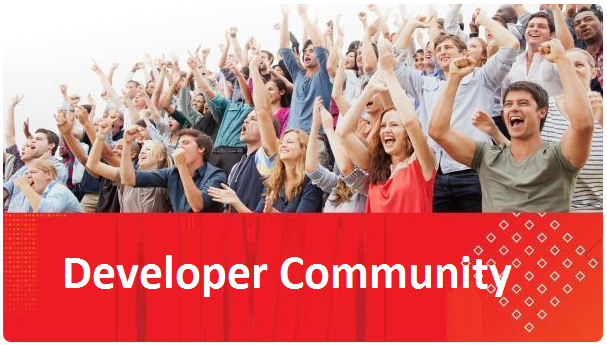 Technology research company Gartner defines citizen developer as "a user who creates new business applications for consumption by others using development and runtime environments sanctioned by corporate IT". While the quote well defines the mission, Gartner does not provide guidance on how citizen development should be adopted on an enterprise IT level so business application developers and core IT work hand-in-hand instead of in a parallel universe. Citizen development promotes a guided do-it-yourself culture when it comes to building mobile and web applications quickly. The idea is to release the pressure on core IT for delivering all the mobile applications while still helping lines of business to go mobile the way they want. Citizen development-ship however is not shadow IT, and where it is, it should not be. 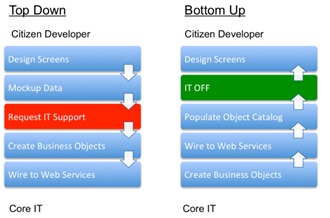 Citizen development works best if integrated in core IT principles and infrastructure. So which methodology is best for adopting citizen development in an enterprise? The two candidate methodologies I like to come up with are top-down or bottom-up. Let me first explain what I mean by the two before calling out a winner. Using a top-down methodology, the business user starts from nothing, mocking up screens, views and data. Citizen developer don’t know about services, which means that they would use a tool that allows them to query for business objects or to upload sample data as CSV files. Once they are done with their prototype, they pass it on to core IT to wire-up the data used in the mobile application to data in cloud and on-premise services. Top-down is convenient to the business developer as it is a visual first development that doesn’t require any technical skill at all (assuming the tool guides the user well). Core IT probably will then look at building business objects for the data used in the mockup and link them, as mentioned, to REST or SOAP services. Read the complete article here.